Volunteers checking a nest box for Leadbeater’s Possums. Photo: Joanne Antrobus. 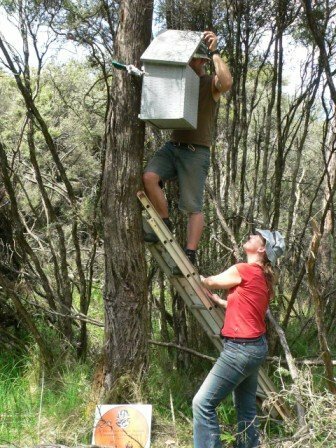 In conjunction with Parks Victoria FLbP volunteers are sometimes required to assist with Leadbeater’s Possum nest box installation and checking. Nest boxes assist the ongoing survival of Leadbeater’s Possum by providing additional homes to supplement the natural tree hollows in key habitat in Victoria’s Central Highlands and at Yellingbo Nature Conservation Reserve (NCR). Nest box installation activites are undertaken as required. 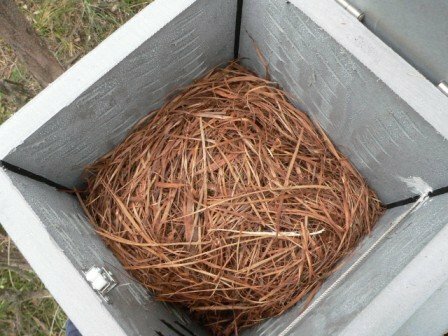 Whilst nest box checking usually occurs twice a year in autumn and spring. This activity does require a reasonable level of fitness. Volunteers are often required to walk varying distances through thick vegetation on uneven ground. In addition they may be required to carry nest boxes (which weigh over 10kg) and/or ladders over this terrain to assist with the activity. BUT this volunteering experience is a great chance to get to some remote areas of our native forests in Victoria and you might just get to see a Leadbeater’s Possum! Installed plastic nest box with unique Leadbeater’s Possum nest present. Photo: Joanne Antrobus.